Ibrox Noise: Odds on favourites and massive bid tabled for striker - is Steven Gerrard getting serious? Odds on favourites and massive bid tabled for striker - is Steven Gerrard getting serious? This one has been doing the rounds for a while, but the last 24 hours have ramped up speculation over Swansea’s Oliver McBurnie amidst the winger being both odds on favourite to join Rangers and being the reported subject of a breathtaking £4M bid from Steven Gerrard. The new manager doesn’t formally start till June but has confirmed that he has final say on all transfers, even if he, Mark Allen, Gary McAllister and Andy Scoulding will work together to identify targets. Ergo, if Rangers have indeed put in a bid of that magnitude for the Scotland international, it would be a serious statement of intent by the board to support Gerrard in every way. Rangers have not paid that region of transfer fee for any player since Nikica Jelavic in 2010, also for £4M, with the closest being the varying sums reported for Carlos Pena between £2.3M and £3.2M. But this would be a pretty bold signing for Rangers to make, and a curious one. 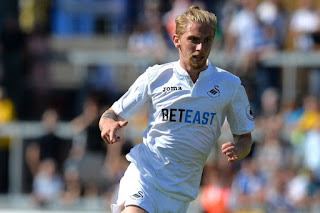 McBurnie has never scored in the English Premier League for Swansea, or for anyone for that matter, and while his record in the Championship is pretty good, there is little about his stats for the Wales side in the top flight which immediately grabs us as stunning – but then, as a young winger/striker at the top level, he’s definitely developing and fared far better for Barnsley. If Steven Gerrard wants McBurnie, it appears the board is eager to deliver him for him. Yasss! Lets Gooo Get it Done!! No they won't. Morelos can learn not to be a greedy b****** & be a great foil for either Cummings or McBurnie. Spend any money on marauding midfielders & a general. Sorry not convinced. He is bang average and after a decent start at Barnsley, he's fallen away. Please can we stop this deal 'hes - a bluenose, so let's sign him'. Nonsense, it's ability and potential and eventual sell-on value that should be our prime consideration: nothing else! And , in my view, McBurnie doesn't tick any of these boxes. Not sure about this one. £4m is too much for an unproven striker. Being young and being a Rangers fan isn't enough. the last two blue noses we have signed are not doin to well at the moment .....Halliday and Doherty, what we need is out and out professionalism and ability and not necessarily passion but if they have the first two then passion will be a great bonus. Being an out and out bluenose does not make a great player. I agree we shouldn't be signing people because they are fans. BUT, I don't see anybody recommending any non-Rangers fans who have a track record like McBurnie that we should be signing. He has a decent record in the Championship for a team that got relegated. He is young with potential sell on value. Where do you get that for less than £4Million? It is a lot of money for us, but do you really think Cummings could do it? I don't, sorry, did nothing in that league. Moult? Has done nothing, in the same league. Marriott & McBurnie both on the radar with Morelos. I would be MORE than happy with them 3. Not seen much of the lad. Looked eager enough playing for Scotland just there. Has the potential for sure. £4M is a lot for us to pay but that’s the market. Would certainly add some quality. I do hope SG is going get serious he knows what will come if he fails only serious contenders where to apply no stopping us now. We need tried and tested players, not allegedly good. We need a striker with a hunger for goal. What we DON'T NEED, is anymore "learners" on the job. That was this seasons mentality and look, where that got us. That 4 mill would be better spent on a striker with a record of goals scored. McBurnie has scored how many, at Swansea?? Setting ourselves up for a fall, with that signing. Joe, like who? We could get McCoist or Boydchenko for less than £4 million, both have a proven record. But Ally is too old and slow and Boyd not much younger or faster. Seriously, who? Cummings, Moult? Someone I haven't heard of? Maybe. I agree defence is a priority, but we need a striker looking to the future. We could hang off and try for McBurnie on a pre-contract in January. His agent will let us know if that is a runner. But Championship clubs will offer higher wages, which can be hard to turn down, so that would be a gamble. If we can get him for £4M, I would take it and get a 5yr contract signed.